Enterprises engaged in deploying, managing, and scaling out Red Hat® OpenStack® Platform have found that rapid production implementations and transparent, multicloud management across private and public clouds require augmenting OpenStack with a cloud management platform. Red Hat CloudForms provides essential enterprise-grade cloud management and automation capabilities that are not available in OpenStack. 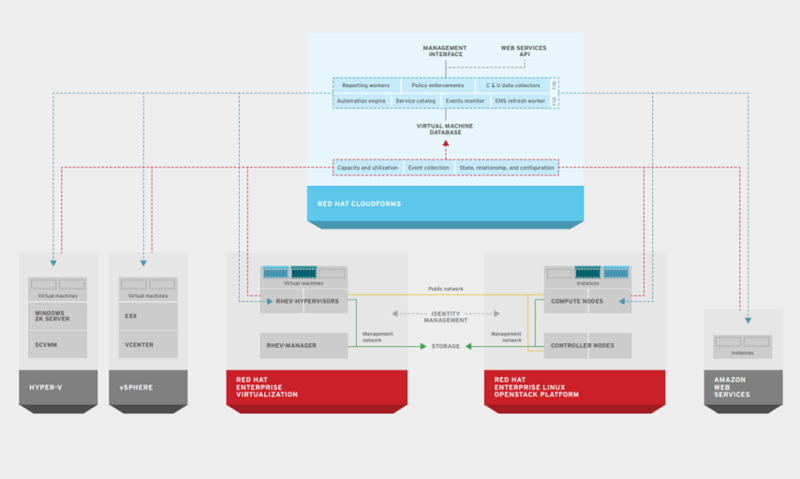 This technical detail describes how Red Hat CloudForms enables OpenStack adoption and improves private and hybrid cloud manageability in the enterprise. End users can request, provision, deploy, operate, manage, and decommission their own services configured with approval processes and enterprise standards enforced. Red Hat CloudForms enables cost transparency and accountability so that business owners and IT can understand the actual cost of the infrastructure required. Constantly monitor the actual consumption of server, storage, and network resources and organize by enterprise-specific classifications. Automatically discover, assess, classify, monitor, and track virtual machines (VMs) in any state—powered on, off, or suspended—without installing agents. Maintain comprehensive visibility of VM configuration, virtual hardware, performance, utilization, allocation, and event information together with relationship and dependency mapping. Red Hat CloudForms provides IT with advanced capacity planning and sophisticated resource management capabilities, including trending and alerting. By combining extensive configuration and change information with operational event data and utilization and performance statistics, the product uniquely addresses both the quantitative and qualitative management requirements needed by enterprises to maximize their infrastructure investments. Red Hat CloudForms fills a crucial management need for Red Hat OpenStack Platform. With CloudForms, customers can more quickly deploy and scale their OpenStack private clouds, combine those with existing IT virtual infrastructure investments, and federate public cloud deployments. Red Hat CloudForms offers enterprises a unified management framework with advanced life cycle management capabilities across OpenStack, as well as other infrastructure platforms, such as VMware, Red Hat, Microsoft, and Amazon. Management. Approval, auto-provisioning, quota, placement/brokering, customization, security, and retirement. Enhanced operations. Performance, capacity, utilization, and compliance to standards, policies, and regulations. Cost allocation. Chargeback/showback with support for multiple rates tables (fixed cost, allocation, and usage) and reservation-based chargeback. Red Hat CloudForms extends life cycle management to Red Hat Enterprise Linux OpenStack Platform. Service catalog publishing and user dialog generation for OpenStack Orchestration (Heat) templates. Deeper image and workload introspection capabilities with OpenStack Image Service (Glance) and OpenStack Compute (Nova) integration. Improved capacity and usage management through expanded OpenStack Telemetry (Ceilometer) integration. These new capabilities in Red Hat CloudForms represent advances in the manageability of OpenStack in the enterprise. Red Hat CloudForms manages the OpenStack infrastructure as well as OpenStack workloads from a single integrated platform. Red Hat CloudForms operates with Heat to discover and inventory Heat multicomposite application stacks. Red Hat CloudForms delivers OpenStack applications and configures related dependencies and required resources through its service catalog. Ceilometer metrics are used to automatically scale applications and enable cloud workload flexing and scaling. Heat provides templates, text-based files that describe all the OpenStack resources to deploy to run your application. The stack is the set of OpenStack resources created and managed as a single unit when Heat’s orchestration engine instantiates a Heat template. With Red Hat CloudForms, application administrators can use commercial off the shell orchestration templates available for Heat, or their own custom templates, to provision multicomposite applications in OpenStack, configure related application dependencies, and orchestrate required cloud resources. Discover and inventory orchestration templates, resource stacks, and associated elements. Import and manage Heat orchestration templates. Model relationships of OpenStack instances with their stacks and stack resources. Provision Heat templates and associated stacks via Red Hat CloudForms services to an OpenStack region. Create reports on orchestration templates and stacks. Red Hat CloudForms automatically discovers, inventories, and models Heat templates, stacks, infrastructure elements, application relationships, and dependencies. Red Hat CloudForms can then provision these templates and stack resources from the Red Hat CloudForms service catalog, using the Heat orchestration engine to provision the stack in OpenStack as a single unit. Hardware and software inventory and configurations for domains, memory, OS, CPU, sockets cores, and other key infrastructure data. Capacity and utilization information, such as total memory, CPU cores, storage and networking, and other important data elements that are consumed, as well as information for running instances and total usage of resources for the entire deployment. Events and alerts generated by OpenStack services and management server that are captured by Red Hat CloudForms and used for policy conditioning and automated responses. Gain visibility into OpenStack components in the undercloud. Check and report on compliance of component configurations. Offer ad hoc remediation and automation for common tasks, such as infrastructure upgrades and hardware failures. Red Hat CloudForms captures in-depth, real-time information for OpenStack running instances, including applications, packages, patches, files, registries, user, groups, kernel and file system drivers, and other key data for capacity management and planning. Red Hat CloudForms administrators can operationally manage and troubleshoot OpenStack workloads in production by remotely logging into running OpenStack instances from the Red Hat CloudForms console. Red Hat CloudForms enables important additional operations management capabilities for the Red Hat OpenStack Platform, including execution time lines, instance and process relationships, genealogies, and state drift. These features allow operational staff to quickly resolve issues or problems in OpenStack production environments. For example, consider the provisioning of instances into the same availability zone as some Tier 1 workloads that are reporting performance issues. Timeline reporting will show performance variations, in addition to providing alerts. Notifications can be sent to external systems showing when thresholds are surpassed. Red Hat CloudForms can create alerts for instance performance or state changes. For example, if an instance was terminated unexpectedly, then Red Hat CloudForms can generate a newer instance. If there is a high demand for instances, Red Hat CloudForms can generate more instances and handle the post-configuration tasks, like updating the load balancer pools, to maintain continuity in the cloud. With Red Hat CloudForms, organizations can extend existing virtual infrastructures into highly scalable enterprise clouds. Red Hat CloudForms decreases the high costs and removes the complexities of cloud infrastructures by delivering key management capabilities in a comprehensive solution. Seamless self-service portals that provide users with role-delegated, automated self-provisioning of catalog-driven IT services, with requisite request approvals and integration with enterprise service catalogs. Cloud life cycle management, from service provisioning to workload retirement, with automatic aging, tracking, and monitoring. Advanced chargeback, quotas, and metering, with detailed usage tracking by configurable classifications and support for multiple rates tables (fixed cost, allocation, and usage) and reservation-based chargeback. OpenStack administrators can manage the internal costs and cross charges of workloads or charge back to the consumer of an IT service. Continuous discovery and insight from automatic, agent-free discovery of OpenStack instances and relationships, capacity, and utilization, along with configuration tracking and drift comparison. Unified operations management portal, with multisite federation that offers visibility across the entire cloud and virtual infrastructure, including runtime operations, service configuration, utilization, events, reports, and timelines. Operational dashboards that let users track resource consumption, audit virtual instances and services, assess compliance, check configurations, and help identify causes of operation problems. Advanced capacity planning, trending, and best-fit instance and VM placement, with factors in resource availability, policies, and business classifications across time periods optimizing planning and placement. Reporting with automatic scheduling and distribution, which includes a rich set of reports, timelines, and charts with detailed information on your cloud infrastructure that shows application, network, service, user account, operating system, and snapshot information across your virtual machine instances. Integration with enterprise IT systems, like service catalogs, configuration management databases (CMDBs), and incident and event management tools. Red Hat CloudForms helps customers significantly accelerate their OpenStack implementations with an efficient, scalable migration framework across traditional virtualization platforms and private Openstack-based clouds. Enterprises can now enable bimodal IT, where a new agility-optimized infrastructure co-exists with traditional efficiency-optimized datacenters for workloads unified by a common management platform.